Angela (Pamela Springsteen) returns to her old slashing grounds, the former camp Arawak, now called Camp Rolling Hills. This time she’s signed on as a counselor, and is determined that everyone is going to have a good time and follow the rules or else they will be ‘sent home.’ As more and more campers end up dea…er, sent home, Molly (Renée Estevez) begins to suspect that perhaps Angela isn’t quite the goody two-shoes she appears to be. It might be too late to do anything about it, as the number of campers dwindles. Whereas Sleepaway Camp was a relatively serious slasher film with comedic undertones, Sleepaway Camp II, is out and out comedy-horror. This is not an unusual thing for horror films in the late 1980’s, but unlike a majority of those films which didn’t work at all, Sleepaway Camp II is amusing if not necessarily frightening or tense in any fashion. It wears its satirical nature out in the open, with characters named after ‘Brat Pack’ actors, and cartoonish gory deaths. There really isn't a functioning plot or even a vague notion of a mystery during the course of the film. It works mainly as a series of vignettes where kids misbehave and then Angela finds a way to dispatch them. The third act picks up a bit when someone finally makes Angela work to try and kill them, but it’s a little too late to be very effective. 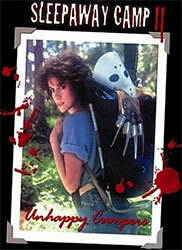 Sleepaway Camp II is a trifle of a film, but it still maintains a sense of fun.